E-voting has been hailed as a possible answer to falling voter turn-out. But there are growing concerns it could imperil the very thing it is trying to save - democracy. While technology has transformed many pockets of life, the machinery of government has, for the most part, remained steadfastly un-mechanised. Until now national and local elections have stayed largely free of computers, electronics and the internet. Many European countries tally votes with machines, but the actual act of voting is done by marking a ballot paper with a pencil or punching a hole in it. The reason is simple - many countries regard voting as too important to modernise and the traditions surrounding voting lend it a good deal of legitimacy. Electronic voting replaces paper ballots with dedicated machines that record a vote when a button or touch screen is pressed. Computers have been used in US elections since 1964 but the move to electronic voting has accelerated with the growing popularity of the net. Yet, initial experiments in "e-voting" have left a trail of concerns. Everyone knows electronic voting machines contributed to the confusion in Florida during the last US presidential election. Many of the machines used in the 2000 poll have since been replaced with touch screen systems and tens of thousands of these were used in September primaries. Perhaps, not surprisingly, voters reported widespread difficulties. 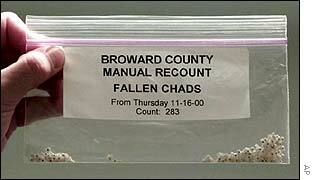 Some voters had to wait hours to place their ballot as machines proved faulty or broke down. Florida Governor Jeb Bush was forced to extend voting hours to cope with the delays. But voting machines that had been shut down would not let themselves be restarted. In Miami-Dade county a few machines reset themselves as they were being used, while others displayed the wrong candidates. During the US mid-term elections in 2002, nine states, including Florida, Texas, California, Georgia and New Jersey, reported problems caused by voting machines. Several websites document the extensive list of headaches experienced by voters across the US. In Scurry County, Nebraska, a landslide was recorded for the Republican candidate but later reversed when it was found ballots had been misread. Once corrected the results showed the Democrats swept the state. The risks posed by an all-electronic ballot are greater still. The biggest problem computers introduce is the removal of a verifiable audit trail of what voters did in the booth. Anyone demanding a recount of an all-electronic election will get the same results the second time round because the only record is in the computers that took the votes. Who can prove if you pressed 'X' or 'Y'? She has called for a worldwide moratorium on the use of e-voting machines until the problems of testing, auditability and security are sorted out. Dr Mercuri has believes e-voting machines are less accountable, less reliable and more prone to fraud than existing systems. Brazil, an early convert to e-voting is trying to make amends by retro-fitting many of its machines with logging systems that provide a separate record of what people did. The lack of a permanent record of what voters did, coupled with the fact only three companies make 85% of the machines used for e-voting and a lack of uniform standards on voting machines, is causing alarm in many quarters. That the errors usually, but not always, favour conservative candidates only increases the suspicions of many observers. More than 100 technology experts have endorsed a declaration by David Dill, a computer science professor at Stanford University, calling for opposition to the use of unaudited systems. California secretary of state Kevin Shelley has set up an investigation into electronic voting machines. And organisations such as Vote Watch have sprung up to compile information about voting irregularities. Teenage rebels were often given to saying: 'if voting changed anything they would abolish it'. They could turn out to be right. Goodbye to the ballot box? E-voting: A load of old ballots? Can a text message save democracy?